Voters in Washoe County Nevada broke turnout records yesterday and helped deliver the state to Hillary Clinton. But by the end of the night, it was clear that Democratic victories in Nevada would be overshadowed by a GOP presidential victory. Late last night Hillary Clinton had just won six electoral votes in the swing state of Nevada and Democrats were getting excited. Big TV screens at the Democratic watch party at the Grand Sierra Resort and Casino showed that Democrat Catherine Cortez Masto had won her hotly contested race to keep Nevada’s open Senate seat blue. Julia Ratti, dressed in a white pantsuit, was moving through the subdued but hopeful crowd with a small entourage. She was already the apparent victor in her race to keep her seat as a state senator representing Reno, Nevada’s second-biggest metro area. She said she jumped up and down when the state was called for Clinton. "Really the reason why is I have had the opportunity to meet hundreds of volunteers that have put their heart and their soul and all of their time and energy into making sure that Hillary Clinton won Nevada and it looks like that’s what’s going to happen." Even though Donald Trump was racking up electoral college votes, Ratti said she wasn’t getting too stressed about the presidential race. Lots could happen at this point, she said. We should just wait and see. Just before midnight, it was clear what was going to happen. And just a few miles away at the Atlantis, another glowing high-rise casino, Republicans were going wild. At the Republicans’ party, you’d never know that Reno, Washoe County and Nevada had gone for Clinton and the GOP had failed to take back a U.S. Senate seat from the Dems. This was already a victory party. As TV news anchors announced Pennsylvania was about to be called for Trump, Caroline Smith cheered. She said she’d been with him from day one. She was a delegate for Trump at the Republican National Convention. "In my heart I knew he was going do it. People tried to sway me from him. I watched him knock out all the sixteen potential candidates," says Smith. "I always believed in him and to this day I still believe in him and I’m so proud of him because I think he’s going to be our next president." 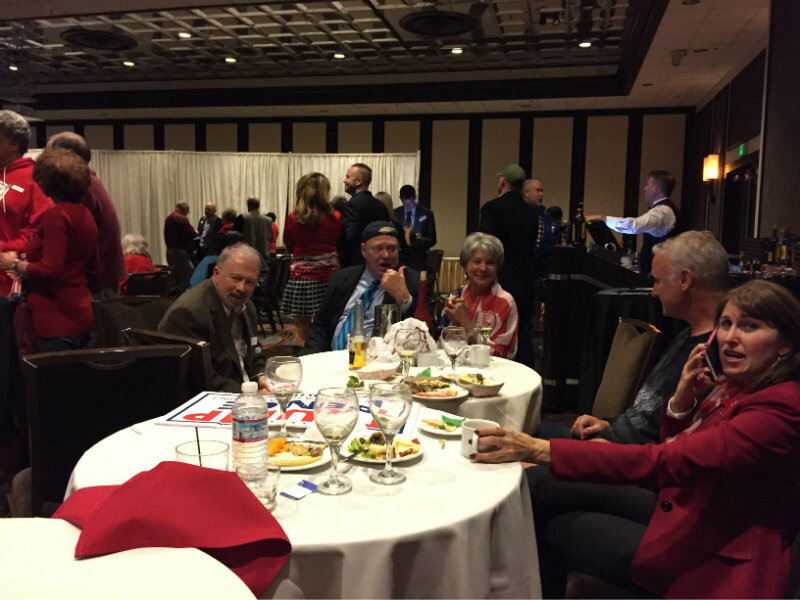 At the back of the ballroom, Washoe County Republican Party Central Committee Chairman Roger Edwards stood soberly. He said he was crushed that the local GOP had not won races it had worked so hard for. "Thousands of hours from a hundred people didn’t accomplish what we tried to accomplish," Edwards says. "But we’ve always been fighting the monster in the south part of the state, and we always will. They’ve got the numbers. We don’t. We did a great job." But his eyes were on the big screen TV. "A historic moment is unfolding right in front of you. This has changed the history of America. And I’m serious about that. And a couple hundred million other people are, too," says Edwards. A few minutes later, Edwards told the jubilant crowd they had to go. The casino needed to clear out the room. Clinton had yet to concede. But first, Edwards led the Republicans in a prayer. "We truly are thankful for, for this may change the direction of America for generations. We want to thank you for all the extra care you’ve given us. In the dear Lord’s name, Amen." Voters in Washoe County, Nevada broke turnout records yesterday, and helped deliver the state to Hillary Clinton. But by the end of the night, it was clear that Democratic victories in Nevada would be overshadowed by the GOP presidential victory. Results from the Nov. 8 Election are in. We will go to various sources to give commentary and analysis on the outcomes of propositions and races both national and local.